I wrote an article about the Hayduke Trail for the awesome online magazine, TrailGroove Magazine. TrailGroove had yet to feature the Hayduke Trail, so I was happy to introduce it to a whole new audience. 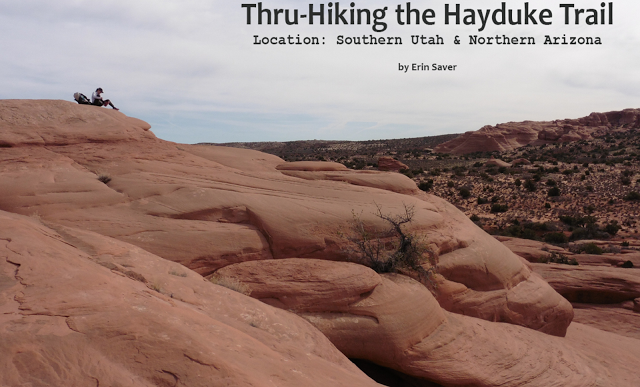 The article is a reflection and summary on my Hayduke experience, along with some of the high and low points of the trail. Seeing all the photos on the full screen layout is always great! In the next two months, I’ll have an article on each the Tahoe Rim Trail and Great Divide Trail in TrailGroove Magazine as well. A note about this particular article, after the content and map portion, keep turning the pages. There are two more spreads of some of my favorite photos from the trail to flip through. Remember that TrailGroove Magazine is best viewed in full screen or presentation mode on your computer. Enjoy! While on the topic of the Hayduke, I’ve had many people ask me about that transition to routes that require a stronger navigation skill set. It can be intimidating and even with the courses I’ve taken, I often worry that I’m doing something wrong or that I need a refresher from time to time. My friend John, who I learned navigation from at the Mazamas in Portland, Oregon has created some excellent instructional videos that cover everything clearly and concisely. They were published by the Columbia River Orienteering Club and are an amazing resource! These instructional videos are just as good (or better!) than any class you can take on navigation and I highly recommend them. Mad props to John and the CROCs for providing these for FREE to the public!!! Click Here for the link to all the instructional videos below….